Researchers at Caltec and Samsung recently developed a silicon lens that’s only about 1,200 nanometers tall — tech that could be used to make some seriously tiny cameras in future smartphones. The lenses inside the next generation of smartphones could be thinner than a strand of human hair. A team of researchers from Caltech and Samsung recently successfully created a flat lens that can be stacked on top of a digital sensor to create a tiny camera combo. A traditional camera lens focuses the image by redirecting the light with multiple pieces of glass — a lens’ concave shape allows the light to pass through the thick middle faster than the thinner edges. Passing the light through several pieces of glass at varying distances to the other pieces in the set creates an in-focus image. Instead of using glass, the researchers instead used two sheets of silicon cylinders. These collections of cylinders, called a metasurface, can be adjusted so that the diameter of each cylinder varies. By altering the diameter of the cylinders, the researchers were able to adjust the way the light passed through the lens to focus the image with one sheet, instead of multiple pieces of glass. Each cylinder is 600 nanometers tall — which would make each double sheet lens about 1,200 nanometers thick. By comparison, a single strand of human hair is about 100,000 nanometers. Each cylinder’s diameter is adjustable, still in the hundreds of nanometers size, allowing the thin sheet to do the focal work of several pieces of glass. The new lens (left) fixes the blur issue from earlier attempts at using the material (right). The team isn’t the first to use a similar material to attempt to focus light for photographs, but earlier attempts resulted in an image that was blurred around the lenses. 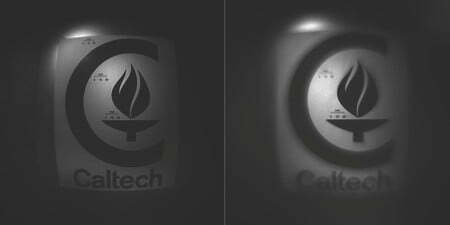 The group from Caltech and Samsung instead layered two of the sheets of silicon cylinders together, eliminating that blur, at least from a 70-degree angle of view. “Metasurfaces like these can be easily mass produced, much the way computer chips are. That means this could be a cheap and easily scalable way to create tiny lenses just a few millimeters in diameter,” said Caltech postdoctoral researcher Amir Arbabi, who also worked with Andrei Faraon, a Caltech assistant professor of applied physics and material science, and Seunghoon Han, from Samsung Electronics. The flat lenses could be easily added to a SMOS digital imaging sensor, the researchers say, because the lenses are developed using similar materials and techniques. Stacking the flat lenses with a sensor could make the technology viable for adding small cameras to consumer technology, such as smartphones and wearables, as well as scientific uses, including endoscopic cameras. The research team’s next goal is to expand the lenses capability by experimenting with adding the lenses to small cameras and microscopes.